Little owlet refuses to wear pyjamas that match. She also refuses to wear warm pyjamas. And she usually refuses to get dressed out of her pyjamas unless there's a very good reason. Here she's wearing her favourite striped leggings, with a frill, size 0. The lycra has bagged out so they seem to have grown with her. 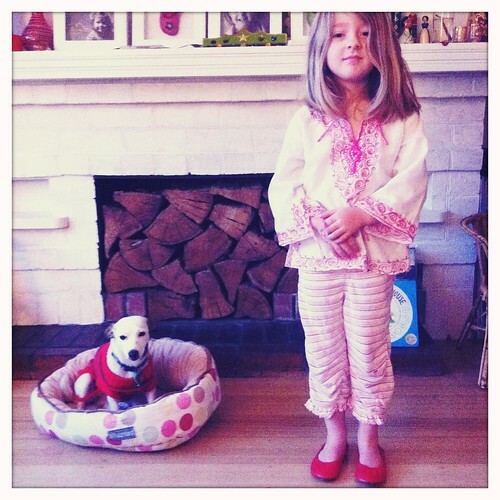 She's also wearing her favourite moroccan pyjama top, purchased for big owlet by my sister in Morocco a few years ago. Little owlet loves to wear shoes, rather than slippers and these are her favourite. Red leather flats bought for her sister at Country Road. Big owlet grew out of these before wearing them more than twice and little owlet has coveted ever since. It seems this is her season. She likes to tap dance in them. And of course, she now sports the ultimate accessory. Tiny dog, wearing a cute stripy jacket that just happens to match the shoes. But she's still a little suspicious of her. Just a little.